We’d love your help. Let us know what’s wrong with this preview of Light on Life by B.K.S. Iyengar. To ask other readers questions about Light on Life, please sign up. 2018 is dead. Long live 2018. This book is truly enlightening on all the finer aspects of yoga I have ever wondered about and which others (mostly online blogging yogis) have barely touched upon with any greater depth. Iyengar thoroughly explains the layers of experience that we learn to inhabit and cultivate while maintaining a disciplined asana practice. He uses many apt and articulate analogies that highlight the connectedness of yogic philosophy and physical practice in all of its esoteric complexity. I finally learned e This book is truly enlightening on all the finer aspects of yoga I have ever wondered about and which others (mostly online blogging yogis) have barely touched upon with any greater depth. Iyengar thoroughly explains the layers of experience that we learn to inhabit and cultivate while maintaining a disciplined asana practice. He uses many apt and articulate analogies that highlight the connectedness of yogic philosophy and physical practice in all of its esoteric complexity. I finally learned exactly what I wanted to know and then some on how yoga affects the nervous system and how it reorients the brain both in physiological terms and in more esoteric terms (i.e. the difference and correlations between mind, brain, and natural intelligence working together.) He explains what it is I am really doing when I extend my limbs in an asana from the gross physiological perspective to the finer cellular perspective that goes beyond the boundaries of my body in the current space it occupies. As well, he explores the roll of time in terms of how the mind processes experience and offers philosophies on the right use of memory and what it means to be always present but to move forward with pure and focused will. He also explores the elements of nature and how asana practice helps us to embody and understand the merging and shaping of these elements within us. The practice of yoga is now more fully appreciated as a vast exploration of inner space from which to live and act. There is much spirituality in this book, with Iyengar making references to the sayings of Jesus and integrating ideas about ego, which I assume are intended for the Western reader. In Hindu culture, problems of the ego are seen more as psychic interference that arise and accumulate from a lack of self-awareness. Yoga provides a comprehensive and superior meditative practice to help meet, understand, and calm the interferences, eventually allowing one to begin to encounter the everlasting presence of the soul. I'm on my SECOND read in a row! This never happens to me. I've just started over at the beginning. Again, I'm learning with every sentence. I'm a yoga instructor and there's so much here for each serious student of yoga to understand... NO, EVERYONE who reads this book will learn so much about themselves. This book delivers on it's title promise. B.K.S. Iyengar is one of the most influential yogis in the world today. He’s written a large number of books on yoga and yoga-related subjects. I love yoga, and have many different yoga books. Most of them are about the asanas or poses. “Light on Life” is completely different from these. Iyengar’s interested in talking about what yoga really is; he also wants to remove certain myths about yoga that people mistakenly believe. For Iyengar, yoga is a way of living; yoga includes poses, breathing (pr B.K.S. Iyengar is one of the most influential yogis in the world today. He’s written a large number of books on yoga and yoga-related subjects. For Iyengar, yoga is a way of living; yoga includes poses, breathing (pranyama), disciplining of the mind, ethics, meditation and much, much more. I can’t begin to explain how full of insight “Light on Life” is. Nor can I explain how thoroughly Iyengar discusses so many different aspects of yoga. “Light on Life” took me almost two years to read. I bought it as a special gift to myself two (or was it three?) Christmases ago, and I’ve been reading it ever since. There is so much here... I am almost stumped about what to include here in my review. Doing yoga changes a person because asanas give us the gift of awareness. It doesn’t happen instantly, but over a long period of time, and with diligent and long practices. Did I mention that Iyengar believes in LONG practices and REGULAR practices. Going once a week to a yoga class doesn’t cut it. You have to set up a regular routine in which you tune into your body daily. This requires huge discipline, but it doesn’t have to happen overnight. He suggests starting with a mere 10 minutes in the morning. Once you’ve managed to do this over a period of time, you can practice for 12 minutes. Change needs to be that gradual. In the asana chapter, Iyengar also spends a long time discussing what needs to be happening mentally and physically during a yoga practice. Physically, you need to sweat. I’ve had trouble with this one, since I don’t sweat easily. In fact, it takes a lot to make me sweat, especially in the wintertime. But beginners, he says, usually have this problem. We don’t work hard enough in the poses to sweat. After a period of time, a ‘wet’ practice starts to happen. Hence the usual yoga instruction to bathe before and after your practice. Okay. You have to work hard in the poses. But what happens mentally? The main thing is awareness. Let’s say you’re doing triangle pose. Good yoga practice means thinking all the time about a) how your feet are positioned b) what’s going in with your legs - which way are they turned c) how the insides of your body are expanding, contracting, filling space etc.... It’s a very active, demanding practice. This book challenges me. It’s written from decades of experience. The pictures of Iyengar and age 88 something doing incredible yoga postures are unbelievable. Wow! How can he do them? His answer is just regular practice. What an inspiring man. I may never have the chance to meet Iyengar (though I’d like to), but I feel very grateful for his inspiring words and instructions! It's too bad this title sounds so much like the other thousands of books out there on yoga, self-improvement, etc. This one brings clarity to the confused, contradictory, flimsy info on yoga's vision of the self, mind & spirit, and Iyengar is always looking out for ways to make the information transferable to a western experience. His thoughts on vanilla ice cream are particularly enlightening. And also, It's too bad this title sounds so much like the other thousands of books out there on yoga, self-improvement, etc. This one brings clarity to the confused, contradictory, flimsy info on yoga's vision of the self, mind & spirit, and Iyengar is always looking out for ways to make the information transferable to a western experience. His thoughts on vanilla ice cream are particularly enlightening. This will stay on my nightstand for the rest of my life, along with the Gita. Currently reading forever! It is amazing that I am actually making any progress in this book... I feel like I stop every paragraph to write a quote down. This book is absolutely wonderful. Life changing ... I am really enjoying how it is changing my perspective on how I move through the world. I've dubbed this book "The Happy Indian Man" due to the cover. I love it! And the inside of the book is pretty damn awesome, too. In Light on Life Iyengar discusses the profound spiritual, emotional and mental effects a dedicated yoga practice can bring to a student. Whereas Light on Yoga focused on the physical aspects of the practice, this book is truly "the culmination of a master's spiritual genius." Iyengar has walked the walk. What I enjoyed most about this book is that it's not dogmatic at I've dubbed this book "The Happy Indian Man" due to the cover. I love it! And the inside of the book is pretty damn awesome, too. What I enjoyed most about this book is that it's not dogmatic at all. It's an honest sharing of "this worked for me." It's almost empiric in its information and sharing of what changes yoga can work on the body, mind and spirit. Iyengar is precise and uncomplicated with his explanations and stories. His parallels and examples are relatable and immediate for a Western reader. In an often contradictory genre of yoga books, Light on Life stands out as beacon (har!) of clarity. 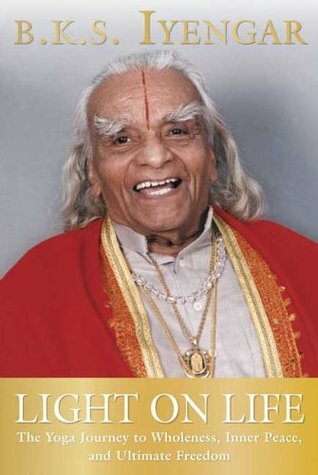 Light on Life is a philosophical approach to yoga from Iyengar and the last book he wrote before his death at the age of 95 in 2014. Yoga these days is incredibly mainstream. We see yoga classes in TV shows even commericals like AFLAC have latched onto the Eastern study of the union of mind and body. Over the past couple decades, I've tried most of the branches of yoga and I've found the older I get the more I return to Iyengar's adherence to form. Flow, heat, etc. are all fine. The Americanizati Light on Life is a philosophical approach to yoga from Iyengar and the last book he wrote before his death at the age of 95 in 2014. Over the past couple decades, I've tried most of the branches of yoga and I've found the older I get the more I return to Iyengar's adherence to form. Flow, heat, etc. are all fine. The Americanization of yoga has made the practice universal-- something all can jump into, depending on the branch you're looking for. Light on Life completely blew me away. It's no wonder this is often required reading for Yoga teacher certification programs. It was the very reason I found myself eagerly devouring this magnificence. Don't let the cover fool you. This smiling fellow, the great Mr. Iyengar, not only knows his stuff, he keeps it real so you don't need a philosophy degree to know what the heck is going on. This is a book any Yogi should read. I strongly feel that Light on Life is so valuable that it should be read re Light on Life completely blew me away. It's no wonder this is often required reading for Yoga teacher certification programs. It was the very reason I found myself eagerly devouring this magnificence. I strongly feel that Light on Life is so valuable that it should be read repeatedly throughout the course of one's life. You would be hard pressed to find any work with so much wisdom in one place. Iyengar's writing – his points, analogies, emotions, and practicalities – were immaculate. Coupled with simple revelations, each page delivers inspiration without fail. And after pouring so much insight, Iyengar ends with a quote from Goya: "Aun aprendo." I am still learning. This is an excellent addition to B.K.S Iyengar's Light on Yoga. Seriously everyone who is searching for something "more" should consider the relativeness of yoga--not just as stretching, but as a spiritual practice toward's growing into your full potential. I started this book last night, and I'm having a hard time putting it down. Oh my goodness, I can't even begin to explain how amazing this book has been for me. As I said before, this book is relatable to anyone, even if they've never done a y This is an excellent addition to B.K.S Iyengar's Light on Yoga. Seriously everyone who is searching for something "more" should consider the relativeness of yoga--not just as stretching, but as a spiritual practice toward's growing into your full potential. Oh my goodness, I can't even begin to explain how amazing this book has been for me. As I said before, this book is relatable to anyone, even if they've never done a yoga pose in their life. It is easy to read, and Iyengar is very real with his philosophies about compassion, pain, healilng, forgiveness, ego, knowledge, intelligence...I am changed because of this book. Really quite good. Nothing astonishingly new if you have read Buddhist, Hindu or Yoga philosophy but he presents it in a clear and well organized manner. But still very much worth reading if you have a more than passing inter Really quite good. Nothing astonishingly new if you have read Buddhist, Hindu or Yoga philosophy but he presents it in a clear and well organized manner. Wonderful book about the spiritual and physical aspects of yoga practice. Iyengar is such a wise man, I will definitely use things I learned in this book both in my own yoga practice as well as in daily life situations. Practicing yoga throughout the years, I longed for background....loved Iyengar's take on the physical body, the energy body, the mental body, the intellectual body and finally living in freedom. Voor yoga is het lichaam 'drager' van nog vier andere 'subtiele lichamen'. Alle vijf in volgorde: fysiek lichaam (stabiliteit) - energetisch lichaam (vitaliteit) - mentaal lichaam (helderheid) - intellectueel lichaam (wijsheid) - gelukzalig lichaam / ziel (gelukzaligheid). Het onderscheid tussen deze 'lichamen' of 'lagen' is niet fysiek in ons aanwezig en bedoeld om over de impact van yoga te kunnen denken en praten. Ik zie het didactische nut van dit soort mentale constructies, maar ook dat het schuurt met de fysieke beleving en innerlijke ontdekkingstocht die yoga propageert. Het streven van yoga is het gevoel van zin en bestemming, 'volledig leven' in (psychologische) vrijheid en met zuivere menselijke relaties (over de mate waarin er zoiets bestaat, zie ook: Franzen, Kahneman, Krishnamurti). Een belangrijk begrip in yoga is gewaar-zijn (awareness): aanvoelen, zintuigelijk. Door asana en pranayama, de lichamelijke oefeningen en ademhaling, wordt het lichaam sensitiever, meer 'gewaar'. "De meeste mensen verlangen van hun lichaam alleen dat ze er geen last van hebben." Dit lijkt zoooo waar als je om je heen kijkt, op je werk, in de stad... Volgens yoga is gezondheid niet alleen afwezigheid van lichamelijke ziekte, maar ook de ervaring van schoonheid en vrijheid in jezelf. Daarbij is er bij asana geen sprake van wedijver, geen vergelijking. Bij asana wordt beweging in ontspanning uitgevoerd. Dat moet wel omdat aangespannen spieren de beweging hinderen - met frustratie en blessures tot gevolg. In het lichaam overheerst massa, stabiliteit, traagheid, in de geest dynamiek en levendigheid. Door oefening komt er meer dynamiek in het lichaam en meer rust in onze geest. In het hoofdstuk over vitaliteit vliegt Iyengar wat mij betreft volledig uit de bocht. Hij gooit alle energie op één hoop: warmte, licht, elektriciteit, zwaartekracht, spierenergie en mentale energie... Het is allemaal hetzelfde, uitingen van het goddelijke: Prana, Qi, Ki, de Heilige Geest, allemaal hetzelfde... En die prana verbindt ons met 'de kosmische intelligentie'. "Tijdens het vasthouden van de adem na de uitademing ervaar je het leven na de dood." Wat een onzin allemaal. Iyengar schrijft uitgebreid over het uitstellen van oordelen en kwalificaties. Dus, neutraal observeren zonder oordeel. Volgens yoga bestaat het bewustzijn uit 'geest' (wispelturig, kan geen keuzes maken), intelligentie (maakt onderscheid tussen goed en kwaad, juist en verkeerd) en ego (persoonlijkheid). Volgens Iyengar is de geest van de mens gericht op korte termijn behoeftenbevrediging: plezier herhalen en pijn vermijden. Die korte termijn-gerichtheid is één van de redenen waarom mensen zo moeilijk hun gedrag veranderen. Volgens yoga leven veel mensen in 'onwetendheid', een identificatie met het ego. Het ego noemt Iyengar een uitputtende, veeleisende en onverzadigbare reisgenoot, een paranoïde, opgeblazen tiran. We herkennen hem veel eenvoudiger bij anderen dan bij onszelf. Iyengar presenteert intelligentie (bespiegeling en keuzes maken) als oplossing (Kahneman komt tot vergelijkbare conclusie). Het gewaar-zijn waar yoga naar streeft, uit zich als intelligentie die geconditioneerde reflexen herkent en 'ingrijpt' wanneer die zich voordoen. Het zorgvuldig uitvoeren van asana en pranayama oefent deze scherpzinnigheid. Laatste element in intelligentie is het geweten: het waarnemen van de gevolgen van denken en handelen. Onwetend in yoga-termen = je weet niet wat werkelijk is en wat niet. The Matrix. Dit begrip maakt het onderzoek naar 'normaal' mogelijk (zie ook Coelho, 'Veronika besluit te sterven'). Onwetendheid is de meest fundamentele 'aandoening van de geest' en vader van nog vier andere: trots (buitensluitende zelfzucht), gehechtheid (eigenaarschap ipv dankbaarheid), afkeer (tegenpool van gehechtheid) en angst voor de dood (angst om vergeten te worden, betekenisloos te zijn). Volgens Yoga zijn er vier levensdoelen: deugdzaam leven, onafhankelijkheid in levensonderhoud, genoegens van liefde en menselijke relaties, vrijheid. Als invulling van deugdzaam verlangt yoga: niet schaden / geweldloosheid, eerlijkheid, niet stelen, onthouding / celibaat, niet begeren / gematigdheid. Kortom, dit boek is een 'mixed bag'. Veel interessante inzichten voor een beter leven; vooral de verbinding van deugdzaamheid met individuele beleving heeft potentieel in een wereld waarin veel mensen individueel levensgeluk bevechten ten koste van anderen. Verder ook veel mystiek die we heel kritisch moeten benaderen om het niet te zien als een volgende religie met dogma's, voorgangers, volgelingen en de belofte van leven na de dood. "Ouderdom kan ons vermogen tot zondig handelen doen verminderen, maar niet ons vermogen tot zondige gedachten of bedoelingen. Oorlogen worden weliswaar uitgevochten door jonge mannen, maar de aanzet ertoe wordt gegeven door oude mannen." "Je leest boeken en artikelen over wat je het beste kunt eten en hoe je moet oefenen, leesmateriaal dat ieder wild dier zou verachten. Maar je weet niet hoe je moet leven, alleen waar je naar verlangt. Het instinct is afgestompt." He goes on to describe how the ice cream is tempting and the ego wants it but if we use our conscious intelligence we will withstand the temptation. But, man, when that ice cream showed up looking so serious at the end of that paragraph, I near laughed out loud on the train. For anyone serious about a spiritual journey/path/transformation, and the rigor and discipline required, regardless of tradition. Beautiful wisdom, insight, and guidance from a truly humble and committed guru. I will read this several times over. I reread so many pages that I think I read the book 5 times the first time round. A book bound in wisdom, experience, light and love. This book has helped me cross the bridge between yoga's physical and spiritual lessons. computer is not just mouse clicking. something more complex and extraodinary things works behind it. similarly yoga is not just physical fitness, something more granular, extraordinary works behind. I read and re-read this book. . .I don't think it will ever belong to the shelf. I just finished reading this for the second time since September. Iyengar's humility and wisdom is so inspiring. He is one of the few people I truly, truly admire. This book was "fruity" in the best sense - ripe with sweetness and integrity. Just look at the cover - what a happy man! Iyengar espouses a philosophy that emphasizes unity, and integrity through action - similar to other human ideas, such as Christianity or stoic philosophy. Yet he is different in the soft, natural metaphor he continually employs, to hint at your intuition. I found myself sometimes examining what he was saying with a wary eye, but knew what he was trying to get at. It's because This book was "fruity" in the best sense - ripe with sweetness and integrity. Just look at the cover - what a happy man! It's because his metaphors sometimes read like this: Life is like a bowl of spaghetti. If someone placed a bowl of spaghetti in front of you, and you were trying to take one string and trace it back to the whole bowl of spaghetti, you could not. But you know all the separate strings of spaghetti are united to compose the bowl of life. Another way his philosophy is different from Christianity/other monotheistic religions, is in the personification of evil; the Devil. He makes the accurate observation that the Devil in Western society possesses an intelligence that is used for evil. In contrast, the Devil in yogic philosophy is not intelligence misused; it is ignorance. All evil is a result of ignorance to the underlying impulse of creation: unity. The concept of unity and timelessness as the cosmic impulse reminded me (perhaps ironically), of the former US motto, still on our US dollar bill: "E pluribus unum", or "Out of many, one." This meaning is transformative not only for society, but on an individual basis. When we unify mind, body and soul, which is the aim of yoga, we live fully and are our best selves. Likewise, when we unify diversity in government, a society is able to flourish. As with both individuals and society, easier said than done. But that struggle is what we are made for.